Imagine playing a duet with a robot: that’s the idea behind Haile, a robotic percussionist that can “improvise” based on analysis of live playing. 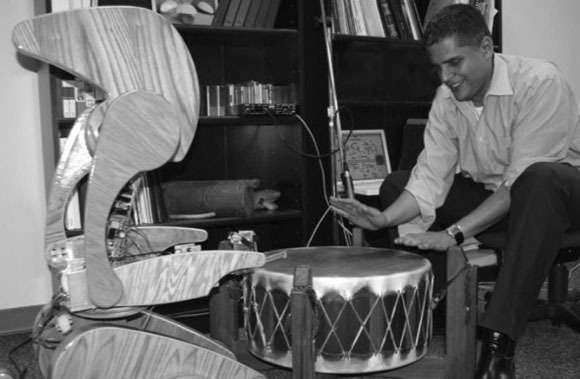 Haile is robotic percussionist that can listen to live players, analyze their music in real-time, and use the product of this analysis to play back in an improvisational manner. 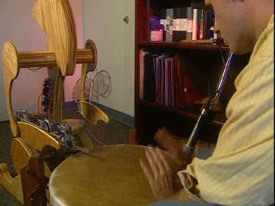 It is designed to combine the benefits of computational power and algorithmic music with the richness, visual interactivity, and expression of acoustic playing. We believe that when collaborating with live players, Haile can facilitate a musical experience that is not possible by any other means, inspiring players to interact with it in novel expressive manners, which leads to novel musical outcome. We use Max/MSP on an [Apple] iBook to control all the interaction, which allows musicians and novices to program the robot and change its behavior to their likings. Robotic body: The wooden body has metal joints for arm movement and easy assembly and disassembly. 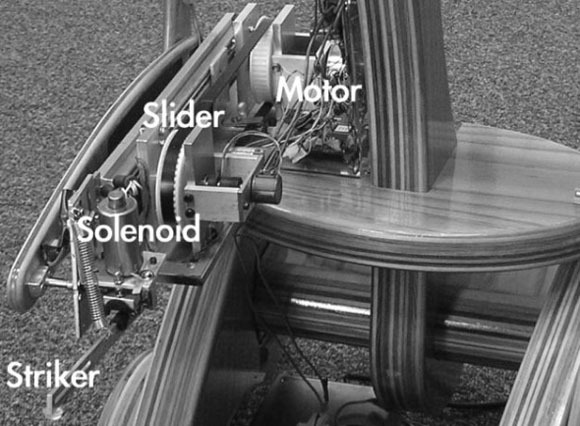 Playing mechanism: A slider/solenoid/striker mechanism is attached to a motor for the actual playing. Not only does the robot have accurate rhythm with its strikes, but it can modulate how hard it’s hitting, too. What it hears: Using a mic on the drum, the robot can “listen” to your playing and analyze when notes occur, and pitch/timbre information. (Max lovers, check out the bonk~ and pitch~ objects.) This allows it to accurately detect drum hits and the quality of each hit. Hardware interface: For connecting the Max/MSP software setup to the robot, Weinberg and Driscoll used a commercially-available Teleo USB control board. The real magic happens in the improvisatory algorithm through which the robot responds to your playing. The robot can simply imitate what you’re playing, “Simon” style, but it can also transform its response (in call and response or variation forms), or accompany you. Like some other musical robots such as the GuitarBot, you can also compose music for it by feeding it a standard MIDI file. Gil promises to keep us posted on the project as it evolves, so stay tuned for more: an extended research paper, updated robot, and more musical performances are in the works. And by the way, if you feel like you were just reading about the Georgia Institute of Technology, you were: Gil’s music department colleague Jason Freeman just gave us the iTunes Signature Maker Jordan Kolasinski covered for CDM last week. I’ll get back to you if I find out what they’re having for breakfast over there.